That’s how I’ve gotten through this week. I’m off today, relaxing and enjoying the return of nice weather. I’m still working on my shawl. Experiments with needle sizes for the i-cord edge finally resulted in actual knitting, rather than knit a few inches, rip them out, knit some more…you know, the usual song and dance. I love my job. I love books. I even love selling books. I don’t love the Summer Stress, the insomnia it causes, the long hours, or the really hard physically-demanding days. I think it all balances out, though. Still, right now, I wouldn’t mind being someplace like this, my favorite watercoloring spot in Tuscany. 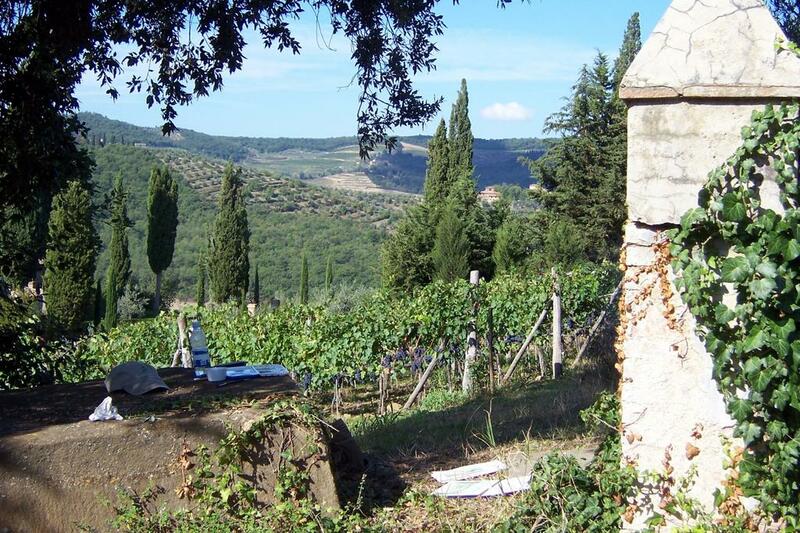 Look closely, and there’s my painting stuff, on that shady block, overlooking the vineyards at Villa Vignamaggio. That was a magical morning. The air was September-in-Italy crisp, the sky was too blue, and that hour I spent there still fills me with happiness and contentment all these months later. I’d love to go there again, even just to sit in that spot to refill my well with the beauty of that place and the loveliness of that time. One of these days I might. And what’s to stop me from finding some other magical spot in another corner of the world? That’s what Side Trips is for.